Lucifer and the Prince of Darkness, image via Getty. 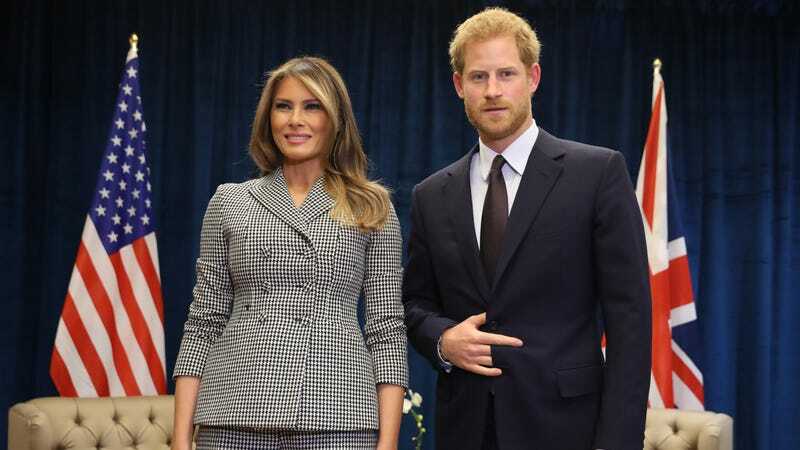 Not but a few hours after Prince Harry met Melania Trump in advance of the Invictus Games (a Paralympic event Prince Harry created for veterans and armed services personnel), Twitter noticed that he made what is unmistakably the sign of the horns: the hand signal of the devil. “[Y]ou’ve been very busy,” he reportedly said. Doing Lucifer’s bidding, he meant. “You’re doing a fantastic job,” she said. Doing Lucifer’s bidding, she meant. Maybe they’ve known each other for longer than we know. Maybe he’s been the devil all along. The devil, fifth from right, via the AP. Image via the AP, enhanced. Alternately, he could be announcing his membership in the gang Latin Kings. You decide, internet.